One misconception that homeowners often express when considering natives for the home garden is that natives will automatically make gardening care-free without any maintenance or the need for ordinary good gardening practices. On the other hand another common misleading notion is that natives always have a wild and unkempt appearance when used in these circumstances. This thinking often means homeowners remain unaware of the beauty and plethora of choices readily available to intermingle attractive Florida natives into our home gardens. Florida is fortunate to have a wealth of resources available to us regarding the principles of using Florida-Friendly plants as well. 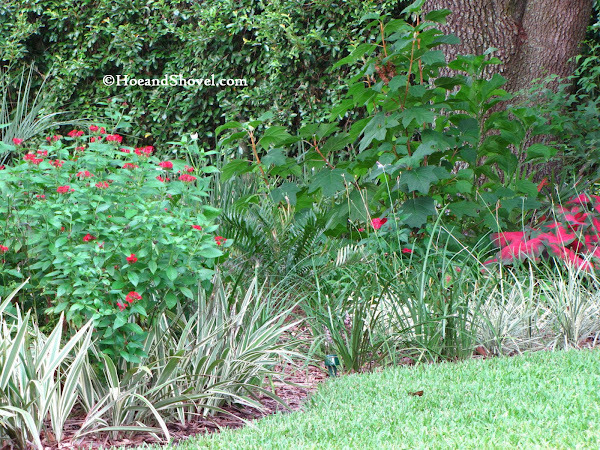 The benefits for the homeowner to create a beautiful AND healthy garden implementing both native and Florida-Friendly plants are many. Florida has about *2800 species considered to be native. The most widely accepted definition of a native plant simply put means it was growing here on or before the first European explorers arrived. 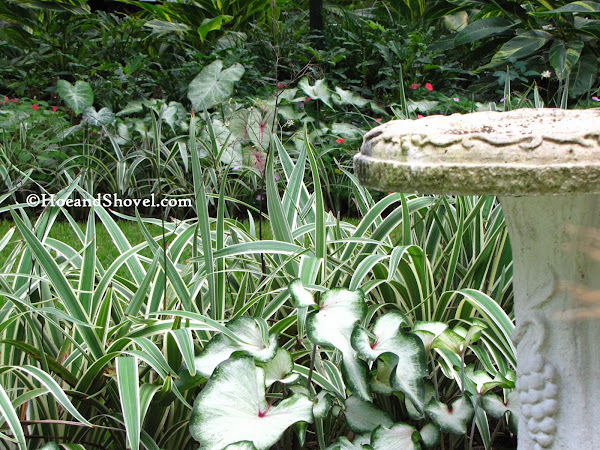 Florida-Friendly means using low-maintenance plants and environmentally sustainable practices. 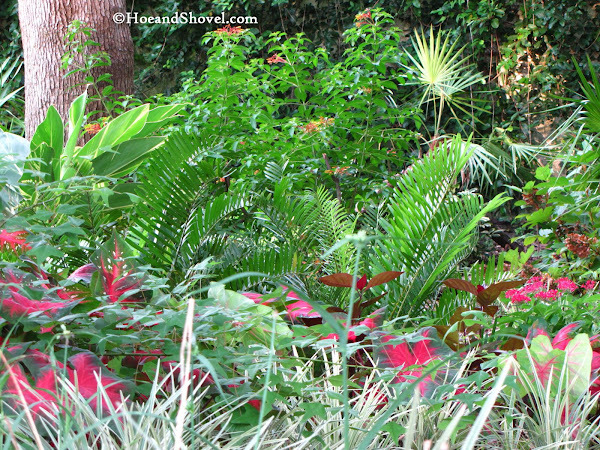 With the right information at our fingertips it is easy to imagine that designing a home garden integrating Florida natives AND Florida-Friendly plants has loads of creative potential for the gardener. Not to mention, once established, this type of landscape is much easier to maintain using less water, less energy, and little or no pesticides or fertilizer. 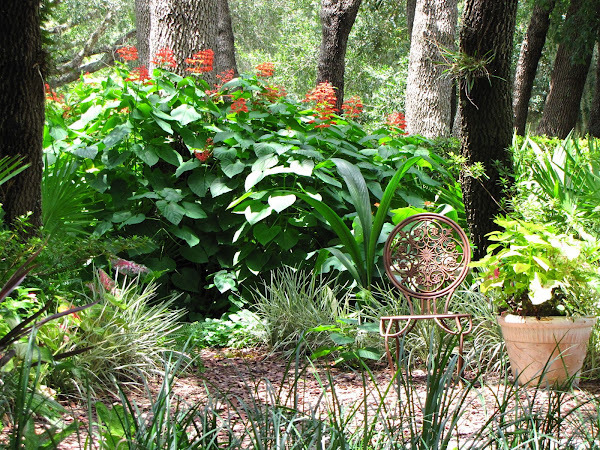 Implementing the 9 Florida-Friendly principles will help each gardener to acheive better results in this endeavor while enjoying their outdoor spaces including the wildlife your garden will attract, shelter, and feed. What we've been working toward at Hoe and Shovel is a naturalistic appeal based on a common sense approach. This just means foregoing the typical sheared hedge-row appearances we are often used to seeing in suburbia. At the same time we forsake the appearance of a roadside piney flatwoods scrub. Finding a balance while being environmentally sensitive is our end-goal. Even though we are located in an established neighborhood we were fortunate to start out with a few undisturbed natural areas on our property that we preserved from the start. As a matter of fact, it was these elements (more than the house even) that first attracted us to our home. Building outward, from those existing oak trees and saw palmettos, layers and layers of vegetation have been added gradually and over many years to achieve a habitat rich with plant- life. Each year over the past 10 years more and more lawn has been removed making way for additional borders. Each time a new area is created great care is taken to build the soil first, then plant. Compost from our own recycled yard waste is always used to amend existing dirt and many times brand new potting soil is purchased and mixed in. Mulch is always placed 2-3" thick after planting using natural products such as oak leaves, pine needles, pine bark, and more recently making my own from the smaller limbs from trees. During the planning process of each new area the plant materials used for the foundation must meet requirements consisting of cold-hardy and drought resistant trees, shrubs, and perennials. Some are natives and some are **plants that thrive in our area. Placing these first gives me a good idea of how I want to incorporate other **Florida-Friendly perennials that might not be as resistant to our occasional hard winters. In general, almost in every instance, the species chosen are required to have bounce back capabilities after a frost. Specific considerations are necessary and important to the success of placement regardless of whether the specimen is native or otherwise. Careful evaluation of the site should be well thought-out. Pay close attention to the orientation of the sunlight as it can change with each season. Review the site to determine the soil moisture and how it is effected by rainfall or other factors such as buildings, driveways, or any other run-off. The condition of the soil is a big factor in Florida. Often during construction debris or concrete rubble can be buried and affect the alkalinity of soil. Or fill dirt is dumped and there is at best a mixture of different types of sand discovered when grass is removed. Thinking of our home gardens as just a small piece of the entire ecosystem wherever we live goes a long way toward doing our part to preserve and manage responsibly the environment entrusted to us. As much as I'm enjoying a more naturalistic approach in my garden I admit I still like my 'edges' clean. Keeping what's left of the lawn mowed correctly and trimmed along the borders is essential. It serves the purpose of delineating the spaces and keeping a tidy aspect while letting the foliage within the borders become a little more free-flowing. Maybe that's just me. Left over from my 'sculptured-hedges' days. But I'm sticking to it because it's the way I like it. We don't claim to be experts at any of this. We've made lots of mistakes in our learning endeavors and our growing processes. By way of example, even as late as this year, I forgot how big the Natchez Crepe had gotten when its leaves flush out each spring. In the winter when southern sunlight was blazing through its empty limbs I planted some sun-loving butterfly plants. Those are now struggling for enough warm rays through shifting, dappled sunlight in the heart of summer. 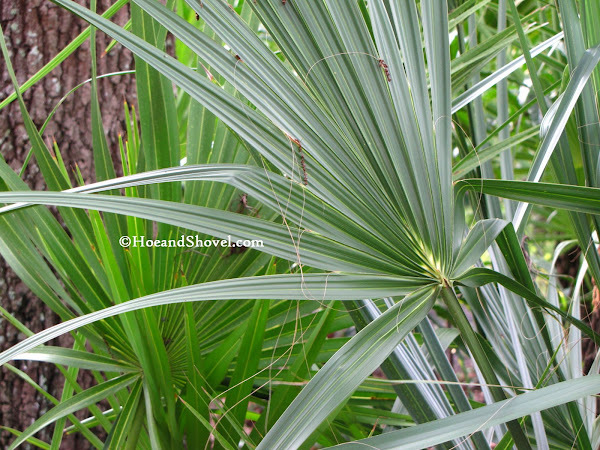 There are purist native plant advocates who do not adhere to the idea of tropicals or exotics in our Florida yards. I can't say we adhere to this strict approach as we love our tropicals (the ones that are not invasive) among our natives. Basically the greatest percentage of our plants meet sustainable requirements. Our tropicals are sited with the same careful consideration for water usage and we find they survive well on rainfall alone when placed correctly. Now if I could just break my addiction to container plants I might be able to stop dragging a hose around the yard. You are welcome to access more photos (along with ones viewed here)in my public Picasa web album here which include captions identifying most of the plants used. Wonderful post, Meems. So beautiful and informative. 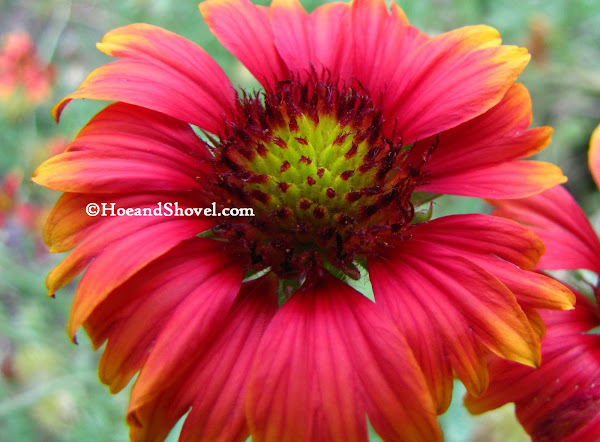 I imagine the recent rains have really helped your gardens to flourish, too. Hope all is well with you. Today is supposed to be a hot one! This is one reason why I like your garden so much Meems. It is wild yet when you look at it it seems quite tame. One can appreciate each and every plant. There are the surprises of the tropicals and your lovely pots. I hope you never lose your addiction to them. Very informative and timely for me. Since I have not been able to tend to my gardens this season due to surgery and planning my daughter's wedding, I have been looking at my areas quite differently. Thoughts to ponder, Thanks! Beautifully worded and imaged, Meems. I think this is a post I will share well into the future. 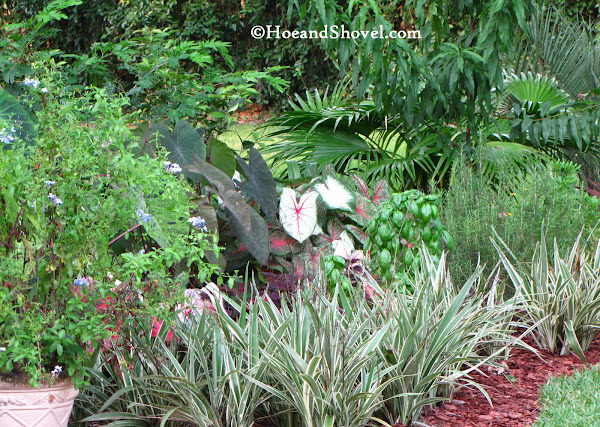 We can all see clearly how Florida Friendly and Right Plant - Right Place works in your garden and how it can work throughout Florida. I am looking forward to seeing the comments on this post as it truly shows us how to succeed. look at me! up early & posting too! enjoyed the stroll around your garden via H&S - if i can't seem to get my 'typical sheared hedged-row garden' expanded, i can always enjoy your 'native/tropical' garden pics! Perfectly put, Meems. There are so many, many well-behaved non-native choices that have been grown here for decades, that there is no need for a "purist" garden. 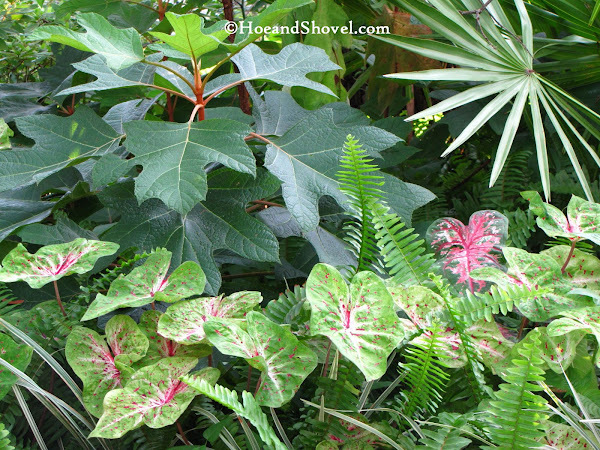 I think I would very much miss things like caladiums and amaryllis and crape myrtles in my garden were I to plant only natives. 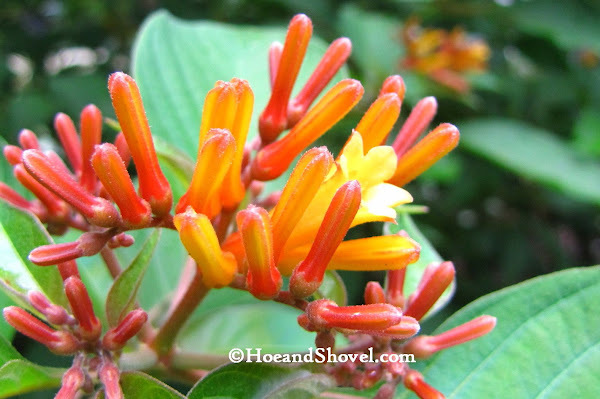 Some plants are cultivars of our own natives, like the firebush in my garden, and I think those are great choices too. On the other hand, since planting my garden, I have discovered a ton of beautiful natives out there, and I think if I were starting over again, I would make room for more of them. I think of things I see out on my Florida hikes, like fringe trees and honeycups. They are so lovely! Why do we never see these in nurseries? I like your statement on "misconceptions." I've learned that some natives can be complete thugs...for example, native muscadines and blackberries. Very difficult to control. Lots of great photos and info! Your garden looks like a little bit of paradise! What a lovely array of plants you have, and they all look so good together. what a great post. things are looking wonderful in your gardens. 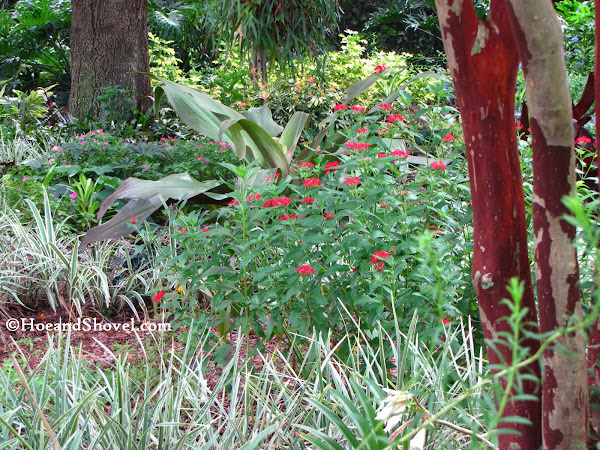 florida gardeners are sure fortunate to be able to glean off of your years of experience. i am loving the mixture of tidy and wild together. Meems: Great post! 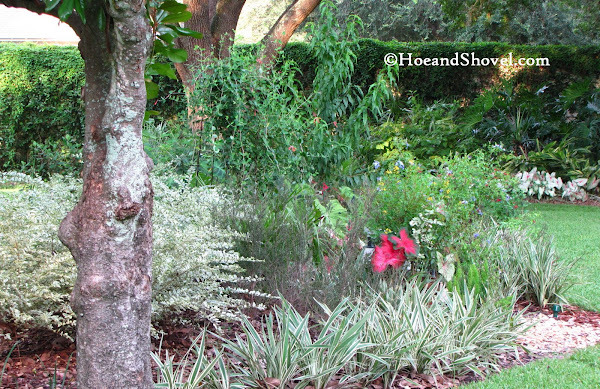 As tiny as my garden is, I have spent lots of time to research the native and Florida friendly plants for my garden. 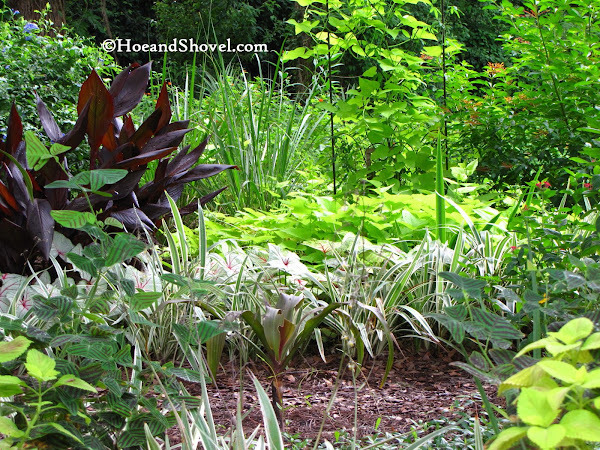 The placement is always a big thing, and often I found I had to move the plants from their original location. Your garden looks so beautiful like always. What is the plant that has purple striped foliage in the last two pictures? Nice texture! Great post.Great information. Bookmark worthy. I buy 2 of everything and see where they do the best.The one that doesn't do well gets moved. I'll never give up on my containers.I use them for pops of color.They're hose-dragging worthy. Meems, I'm not sure where to start! Your garden is by far, amazing! Secondly, I enjoy a trimmed edge of lawn as well, even if it is dwindling. It makes everything neat and tidy. I also subscribe to your idea of native and noninvasive tropicals. Although I've turned my focus toward more natives lately. They're much easier and can provide a fantastic base to your entire garden. Finally, I MUST know what the plant is in the second to last photo...the zebra stiped foliage has me in a tizzy!!! 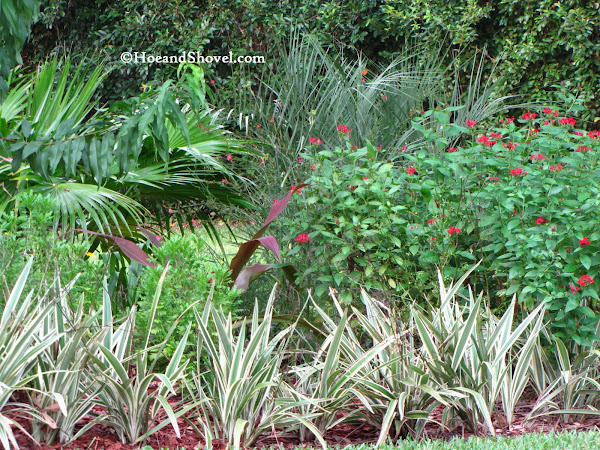 Thanks for sharing these pictures and all the info about how you plant these natives and Florida-Friendly plants. The photos are beautiful as always and reading the thinking behind the plantings is so helpful. I've been a "thoughtless" gardener in the past but am trying to be more intentional. Seeing how you incorporate the tropicals and those great pots is something I love about your garden. It all blends so beautifully. The rains were wonderful but now we are as dry as we were moist... crazy patterns. Really humid and hot... blessings to you. I'm always wondering how the photos actually portray the 'real' garden. I'm glad you see it the way I do... and thanks for always visiting. The thing about most gardens is that they do take a lot of our time. So if anything out of the ordinary comes up they suffer. There is certainly no 'maintenance FREE' gardens but these principles and plants(once established) go a long way toward a much more LOW-maintenance system all together. Best wishes to you and your family during these busy times. Great information for anyone. You don't have to live in Florida to make use of your ideas. I could rename it "Designing with South Carolina Natives and South Carolina-Friendly Plants" and add our plants in there! Some of which are on your list already!! Great post. Thanks for stopping by ... and early, too. You HAVE expanded your garden lately... a little at a time works, too. Love your new trees! The purist come from the thinking that anything non-native displaces an otherwise useful native. I'm sticking with the common sense approach of blending both the well-behaved non-natives with as many natives as possible. Aesthetics are important to me in a suburban setting and you are right there are SO MANY good choices. I'll always have containers (over 65 of them at present)they are just too fun to design/create to give up on them. Thanks for visiting all the way from beautiful Hawaii. The thought of living/gardening there just seems so romantic. It is amazing how similar our permaculture is with asian countries as well. Summertime is our little paradise after an unusually cold winter. I can't wait for some cool-er weather though and the fall season. Thanks for your visit. It's been an interesting transformation but I am getting there with discovering the unique beauty that each native plant offers. I noticed yesterday the beautyberries are beginning to turn already. I will love watching the progression each day until soon it will mean the autumn is upon us fully... oh, happy day. The great thing about this philosophy or way of doing things is that it can be adapted to gardens large and small and everywhere in between. Placement requires lots of forethought and trying not to be in a hurry or impatient would be key as a smaller garden the choices made really stand out. In a larger garden there is probably more room for forgiveness. 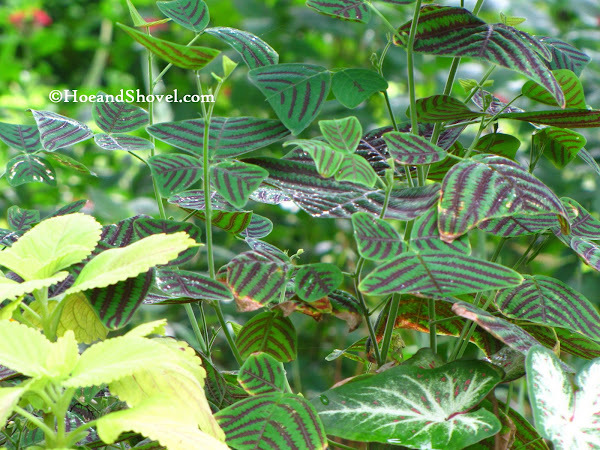 The plant you are asking about is a semi-shade plant called Christia Obcordata 'Swallow Tail'. It is working out well in (3)containers receiving dappled light then late afternoon sun for about 2 hours. Containers are definitely so much fun. 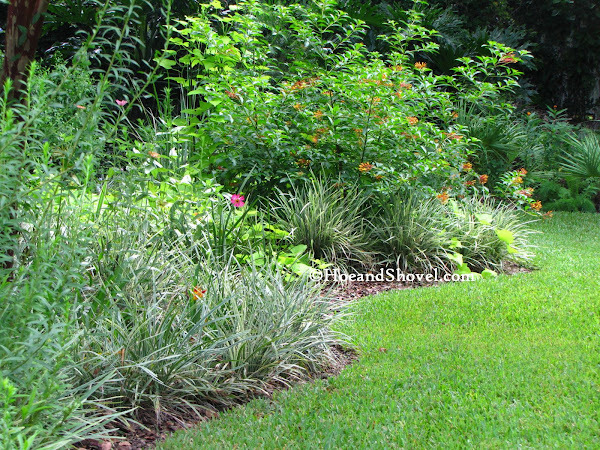 They DO add height, depth, and pops of color and texture in the midst of borders and beds. I could stand to do some minimizing where they are concerned ... only it seems like I'm always increasing instead. :-) I'm glad you liked this post. Working on the base of garden is elemental in my view. You are smart to think of natives and add them as you can making them the standard. Then the fun stuff isn't so prominent... it all just blends in and becomes the total appeal. The stripey plant is a fun addition to my foliage addiction. 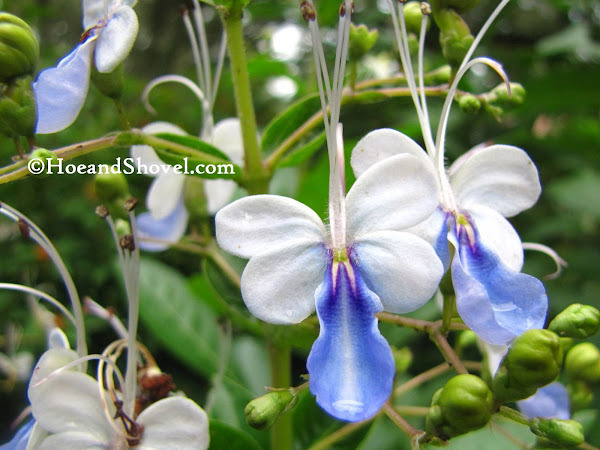 It is called Christia Obcordata or 'Swallow Tail'. Its wispy stems with the butterfly-shaped wings make the leaves look like they are flying when a breeze catches them. You are welcome... as always... so nice of you to visit. For what it's worth overcoming the so-called thoughtless gardening (I think) can be resolved by working on one section/area at a time. My suggestion (to others that have expressed this issue) is to start somewhere (usually a prominent area a gardener will see often, i.e., the front entrance area or the view from a favorite window/porch) and plant it out to completion. Adopting this philosophy almost makes you have to 'think' about it more completely rather than scattering all over the garden trying to get a bigger look too quickly. Moving on from there the garden builds off of itself as well as giving the gardener a chance to get inspired with more ideas for more areas of the garden. Oh, good. I wasn't sure about that since I've only gardened here all my life. :-) The considerations before planting (anything)I imagine would be the same though. Hope all is well. Hi Meems-dear, Your photos and prose are SO inspiring and interestingly your principles apply to my garden so far away. The bounce-back and the soil amending... the naturalistic approach, yes, with the mostly-clean lines giving way to a lush cacophony of foliage and flower--so true. And the two extreme assumptions about natives, weedy versus carefree...yep. Balance is required in the garden for sure. My friend Carol is using a chipper/shredder to make compost and is trying to talk me into getting one. I love the end result but must admit that power tools kind of scare me. I hope you're in the midst of a cooling trend. I hear it's been hot down that way. Lots of great advice, Meems. Your garden lovely garden is a testament to the fact that a mix of natives,Fla-Friendly and tropical plants spells success in Florida. Thanks for sharing so many great ideas. No cooling trends so far... but we are used to this heat. Oh, I LOVE my chipper/shredder... especially the fact that it has so much power. You might want to re-think one... it really does come in handy. I think our gardens are very similar. Thanks to you I've added some very fun plants to my Florida garden. Thanks for your kind words. I am dreaming of a lemon tree lately. 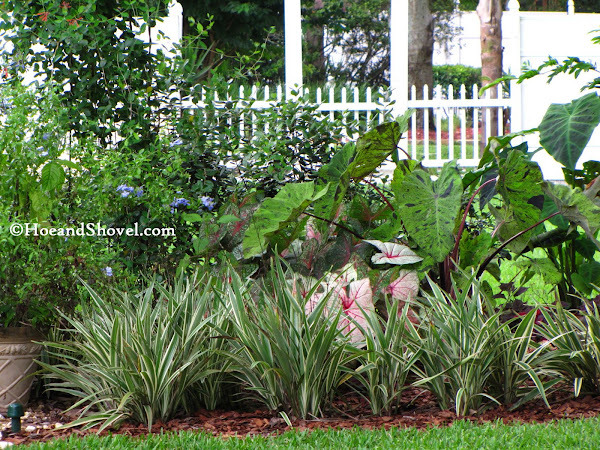 I'm loving the beds planted with natives and Florida friendlys -- they make it look like I'm working hard when I'm not! My front beds (where I do not spend much time) are looking pretty lush with just sweet potato vine, galliardia, pagoda and purple queen. A manicured edge establishes some faux order and all I do is weed and thin out plants, which the neighbors happily take. Your philosophy has been the same as mine, Meems, to integrate native and Florida-Friendly plants seamlessly in a suburban landscape. Your carefully planned mature garden is giving me inspirational glimpses of what our "Extreme Yard Makeover" will hopefully look like in a few years.